January 22, 2019 January 28, 2019 by Julie Gaston . Posted in " Uncategorized " . Identifying and accurately dating a pregnancy early in the first trimester is vital information for appropriate obstetric care throughout pregnancy. A proper EDD is critical in decisions regarding interventions, monitoring fetal growth, and scheduling and interpreting antepartum tests. 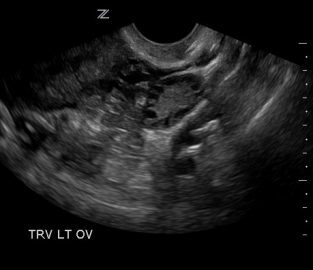 What do we do if the LMP differs from our ultrasound findings? 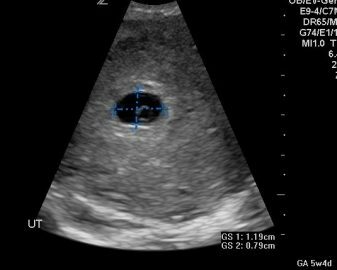 Below is a case study of a patient that presented to the office with a positive urine pregnancy test and an LMP that gave her an EDD of 7 weeks and 5 days. The exam began with a transabdominal approach. This is appropriate considering that the fetus should be almost 8 weeks along. The patient had an empty bladder. The images below are of a longitudinal (left) and transverse (right) slice of the uterus. You can see that the uterus is in an anteverted position but no gestational sac or fetal pole are identified. The next step is to evaluate the uterus transvaginally. Here is a beautiful image of the cervix. It is important to identify the cervix first and then follow the uterine body to the fundus. 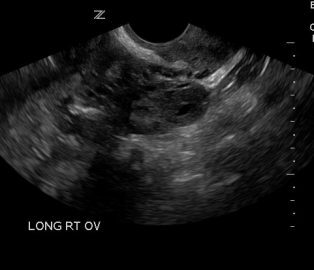 Once the fundus is reached, scan through the entire uterus. During the sweep, you are looking for a couple of things. You should see the gestational sac in the fundus, adjacent to the endometrium. Once you do that, it is ok to zoom in on the gestation sac to better evaluate the intrauterine pregnancy. 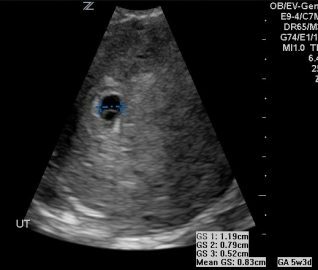 Here is a zoomed in still image of the gestation sac. You can see the yolk sac taking up almost half of it. Clearly this is not a 7 week pregnancy. When you are evaluating an early first trimester pregnancy and there is no visible fetal pole, you must measure the gestation sac in three planes and acquire the mean sac diameter. 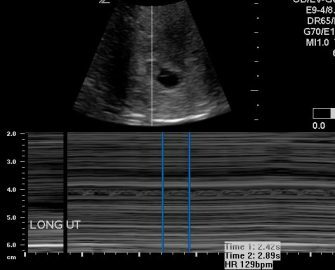 Remember that the mean sac diameter must be at least 25 mm or greater before declaring an anembryonic pregnancy when not seeing a fetal pole. The first image is a sagittal slice of the uterus. Here you will measure the gestation sac in two planes (sagittal and AP). The next image is a transverse slice of the uterus. Here you will get the third plane for the mean sac diameter. Remember to use your calculation package on your system and select GS for measurements. The system will calculate the size and give you an estimated date. Here, we see that the mean GS diameter is .83 cm which equates to 5w3d. The mean sac diameter is not recommended for estimating a due date. Therefore, a follow up was scheduled for 7 days later. Note the CRL measurement of .52 cm which equates to 6w2d. This is consistent with the mean sac diameter dating the week prior. Crown rump length measurements taken in the first trimester remain the most accurate method of establishing or confirming the gestational age. Note the table below, which explains the criteria for re-dating in the first trimester. In summary, when less than 9 weeks use the ultrasound findings over the LMP when the discrepancy is greater than 5 days. When LMP places the pregnancy between 9w0d and 13w6d use the ultrasound findings when the discrepancy is greater than 7 days. 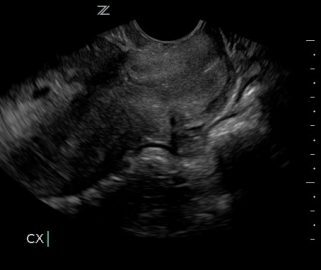 AIUM practice parameters for the performance of Limited Obstetric Ultrasound Examinations by Advanced Clinical Providers include the evaluation of the adnexa. 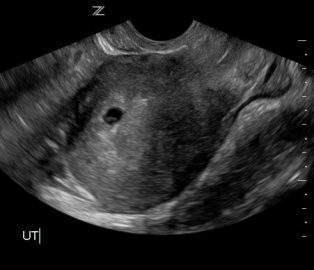 Above you can see the right ovary with the presence of a corpus luteal cyst and the normal left ovary. 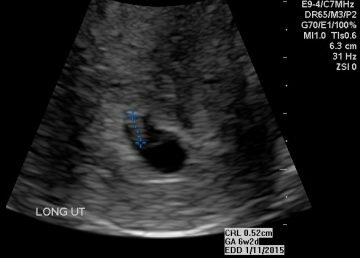 This patient’s due date was adjusted according to the ultrasound findings.